October baseball means the World Series is upon us, and can bring some exciting energy to the sporting world. The two best teams from Major League Baseball square off, and many unexpected things can happen. While weather is not necessarily in the minds of the players, it certainly can throw a curveball into game preparation. Throughout the regular season, teams play 162 baseball games, and most of those games occur in the summertime. By the time the playoffs roll around, fall approaches, and the weather can take an odd turn. October in the United States is an interesting month climatologically. Depending on where you are, you might still be experiencing summer like weather, and in other areas, more winter like. The time of the month is also important, as can be seen in the graphic below. Climatological average temperature for each day in October. Based on a 1981-2010 climatology. Source: PRISM Climate Group, Oregon State University. This is an animation of the typical average temperature for each day in October. This is based on a 30 year climatology, calculated between 1981 and 2010. At the beginning of the month, most of the continental United States has temperatures in the 50s, with the exception of mountainous areas. However, as the month goes on, colder air typically begins to move southward from Canada. By the end of the month a good portion of the United States now typically sees temperatures in the 40s. While the World Series has occurred in all parts of October, it typically now falls into the end of the month (and sometimes in November too). So players looking to raise the Commissioner’s Trophy should also be prepared for cooler temperatures. Source: NOAAs National Centers for Environmental Information. It is not surprising these results truly depend on where the team is located. For a more localized analysis, here is the climatological average temperature for the month of October for all 30 baseball teams. Values are based on the stadium’s nearest airport weather station, and the value is an average of all Octobers between 1981 and 2010. 17 out of 30 teams experience temperatures in the 50s (green) for the month of October, while 6 are in the 60s (yellow). The most northerly teams (Toronto and Minneapolis) experience temperatures in the 40s (blue), and the most southerly (Tampa, Miami, Anaheim, Houston, Arizona) experience summer like weather in the 70s (orange). It should be noted these are average temperatures, which take into account both daytime highs and nighttime lows. Since most World Series games begin in the evening, after the sun goes down, typical values should be lower than what we see here. While temperatures are usually similar at nearby locations, local influences can certainly change the climatological value. This is why there are differences in cities with two teams (New York, Chicago, Los Angeles, Bay Area). There is about a 30 mile difference between Dodger Stadium and Angel Stadium, and as a result there is a 1.4 degree difference in the climatological average. Chicago, whose stadiums are about 15 miles apart, see nearly a 2 degree difference in their averages. Possible reasons for these differences include where the station is sited, what instrumentation is used, and local affects such as land cover and solar radiation. According to the above graphic, the possible World Series matchup which has the largest swing in temperature would be the Miami Marlins (79.9) versus Minnesota Twins (48.9). This World Series with a 31 degree swing has not happened yet. However, in 1997, the Miami (Florida) Marlins did play the Cleveland Indians, which experiences October temperatures around 53.8. 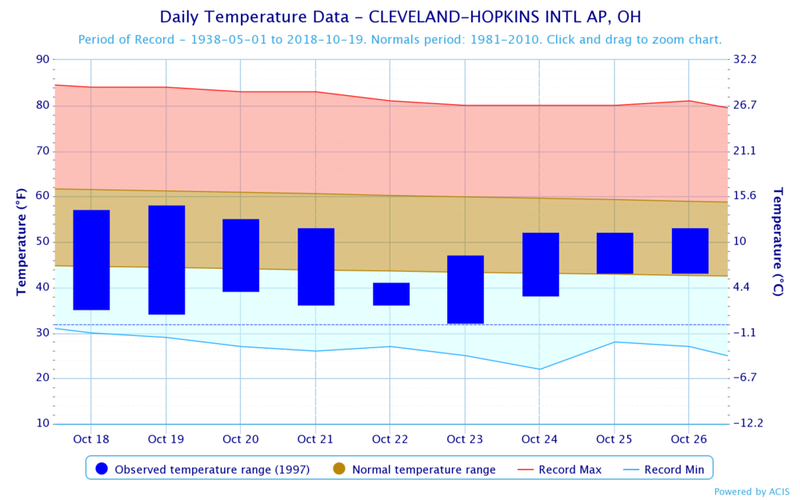 In October 1997, temperatures were above normal in Miami, and cooler than normal in Cleveland. This resulted in Miami home games in the 80s and Cleveland games in the 40s. In fact, Game 4 of the World Series is one of the coldest World Series games on record, with a game time temperature of 38F, and wind chills down to 18F. Snow flurries were also reported during the game. Cleveland won that game 10-3, however Florida would win the series in Game 7, which had a high temperature of 86F. Sometimes, weather can provide a home field advantage.